Imagine being able to carry around your PC in your pocket, using it as a smartphone by itself and as a full-fledged PC when connected to a display, keyboard, and mouse. For people who work on the road or in multiple locations, that sounds like nirvana. Ditto for shift workers, from call centers to retail associates, where you have more employees than terminals at any given time. That's exactly what HP's $799 Elite x3 claims to be: a Windows 10 Mobile smartphone that transforms into a full PC when you connect it to desktop peripherals, whether via a dock or wirelessly. But the Elite x3 isn't a full PC, because of Windows and Office choices that Microsoft has made -- and it can't be one. Thus, the Elite x3 falls short of its core promise. Plus, it's an awkward smartphone you won't want to carry around. The PC industry and the mobile industry are both trying to figure out how to evolve, with PC and tablet sales declining, and smartphone sales stabilizing. Innovation for those various form factors has also stalled, causing Apple, Google, Microsoft, and others to rethink these devices as a continuum of clients called omnidevice. The Microsoft Surface Pro, Apple iPad Pro, Google Pixel-C, and other tabtops are one example of this experimental evolution. So too is Google's enabling of Chromebooks to run Android apps, and its rumored ultimate merger of Android and Chrome OS -- as are mobilelike laptops like Apple's MacBook 12 and the array of 2-in-1 hybrid Windows laptops out there. The Elite x3 joins this parade -- but it's not a new idea. Motorola tried a similar move five years ago in the form of its Atrix Android smartphone, which you plugged into a Motorola Lapdock laptop-style dock and could then run both native Android apps and the desktop Firefox browser (for websites, not PC apps). Sadly, the Atrix and Lapdock were an awkward, limited combination. Android apps didn't scale up to take full advantage of the laptop's screen, for example. 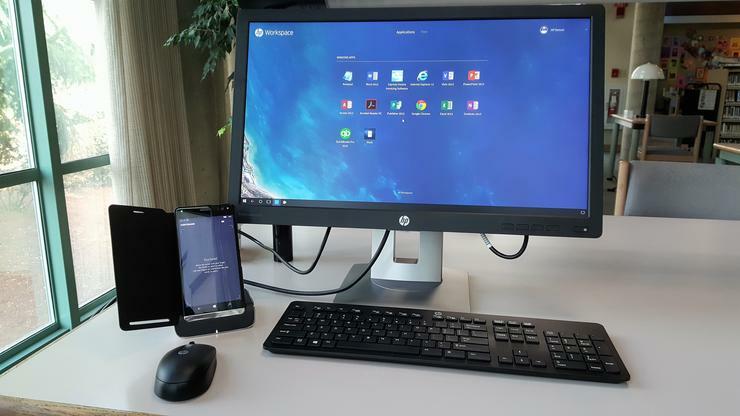 The HP Elite x3 relies on Windows 10 Mobile's Continuum feature to run apps at full monitor resolution when connected to an external display. The Elite x3, by contrast, does scale up mobile apps using Window 10 Mobile's Continuum feature, so those Windows 10 Mobile apps look and feel like native desktop Windows apps when you're using an external display. iOS can't do that, nor can Android -- the best you get on those operating systems are apps that self-configure for a smartphone or tablet screen, but not for external displays. Here's the rub: You're running Windows 10 Mobile apps, not real Windows apps. Not only are there very few such apps -- the only browser, for example, is Microsoft's Edge -- but the ones that exist can't do what real Windows desktop apps can do. Look no further than Microsoft's own Office apps. At first, you'll be impressed that, when you run Word or Excel from that docked Elite x3, you get a desktoplike full screen. Sure, the Windows 10 Start menu is replaced by the smartphone's home screen, but that's fine. Excel, Word, PowerPoint, Outlook, and Edge all look like the real thing. When running apps on an external display from the Elite x3, you get the Windows 10 Mobile app -- not the full Windows 10 app -- and the Start menu is replaced with the Windows 10 Mobile Start (home) screen. Except they're not the real thing. You soon realize that you're not running the Windows desktop you expect and probably need. Office for Windows Mobile is much, much less capable than the Windows 10 Office version, much less capable than the MacOS Office version, and even less capable than the iPad Office version. (It's about a match to the native Office for Android version and to the Office Online browser versions.) The same holds true for Outlook, where the functionality suffers from the same limitations Microsoft has imposed on all platforms but standard Windows. Thus, your Elite x3 lets you touch up and revise Office documents, but that's about it. Forget about serious document creation and formatting -- no style creation, for example. It's simpler to stick with a laptop if you need full Office on the go or to use iOS or Android mobile devices (and get access to their much larger business app libraries). Did I mention how very few native business apps are available for Windows Mobile? You'll also quickly realize you don't get the full Windows capabilities such as taskbar widgets. You are running Windows Mobile, not Windows. This is not HP's fault, but Microsoft's. Microsoft has not ported the full Windows to mobile devices running on the ubiquitous ARM processor, merely a subset. HP can't fix that; it can only decide if it should build products on what Microsoft has made available. When in display-control mode, the Elite x3's screen becomes a trackpad for the external display. Yes, the Elite x3's ability to show a full-screen app on an external display is cool, as is its ability to provide access to keyboards and mice. But that cool factor is not worth running a crippled subset of Windows apps. Nor is the full-screen app display as cool as it might be. For example, if you directly launch an app on your Elite X3, then enable external-display control, the app running on the phone is not moved to the external display. Instead, you have to separately launch the app from the external display's Start menu. That's an unintuitive UI choice, though it does let you run one app on the smartphone and another on the external display. 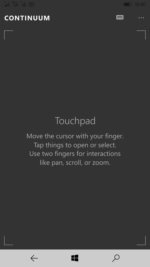 When you enable external-display control, the Elite x3 functions as a trackpad for the external display, similar to how Apple's Remote app lets you control an Apple TV for iTunes playback. As with the Apple Remote app, the experience is initially awkward and unnatural, though it works if you find yourself mouseless when working on the big screen. It gets easier over time, as you mentally map the touchscreen's virtual canvas to the external display's screen real estate. You can access the full Windows apps (for which you have licenses, of course) if you pay for HP's subscription-based Workspace service, which is basically a virtual desktop infrastructure (VDI) where the real clients run on HP's cloud and users access them remotely. You can also use other VDI systems. But what a wasteful way to get the real Office and other Windows apps. VDI can be slow and requires a strong broadband connection, which is not always available to mobile users. In the case of Workspace, HP manages the back end, so it won't be as painful as deploying on-premises VDI, but it's still another link in a chain to monitor and manage. Also, the virtual desktop is separate from the local device. Although this serves to keep corporate documents from leaving your back-end servers, it creates a confusing duality of local versus remote work. HP Workspace allows users to connect to corporate Dropbox accounts (Google Drive and Box access is in beta), to which they could then be permitted to access directly from the Elite x3 smartphone for mobile usage. Oddly, HP Workspace doesn't support the Microsoft OneDrive or SharePoint services that a Windows-centric organization is likely to have in place. 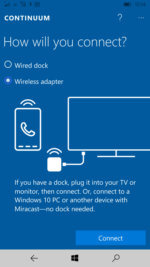 Because HP Workspace doesn't function unless the Elite x3 is docked to an external display, it's only useful for scenarios where users will assuredly be working at a Desk Dock-equipped office. Other VDI systems can run apps on a smartphone screen; if your users work on the go and you want to keep some apps restricted to the back end, HP Workspace isn't the right choice. Rather than mess with the overhead and complexity of VDI, it's typically better to issue users a Windows laptop or MacBook, which also ensures your users have all the capabilities they need, when they need them, on devices you manage like your others. Speaking of management, that's another area where the Elite x3 is overly complicated. Here again, the fault is Microsoft's, not HP's. Windows 10 Mobile isn't managed the same way as real Windows 10 PCs typically are: via System Center Configuration Manager (SCCM) or similar tool. 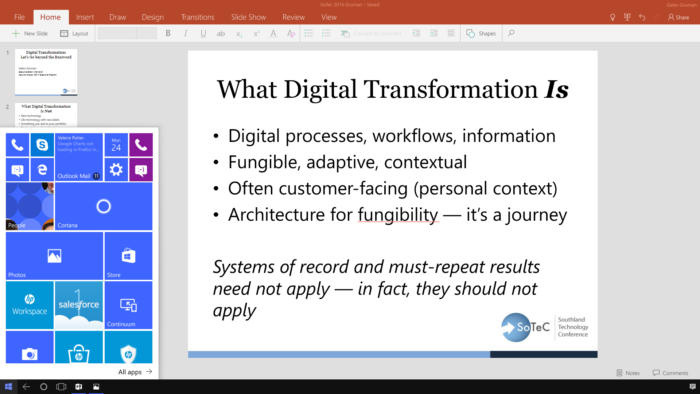 Instead, you manage it via Microsoft's Intune or an enterprise mobility management (EMM) suite as if it were an iOS or Android device. You can use SCCM to manage Intune and, in turn, manage the Elite X3, but that's a complex setup. Or you can manage the Elite x3 directly via your favorite EMM tool, without SCCM at all, again as if it were an iOS or Android device -- as long as your mobile team is prepared to manage these pseudo-Windows devices. I do believe that PCs and mobile devices are on a path to joint, universal management, and if you're exploring Windows 10-based EMM for Surface Pros and the like, you might as well add Elite x3s to the mix. But you'll be at the bleeding edge for the next few years, as will your users. Deploy accordingly. Remember: A Surface Pro can be managed by both the old-school SCCM approach and the new-school EMM approach; the Elite x3 only by the EMM approach. The Elite x3's hardware ecosystem is also complex to manage because you will either need a dock and compatible hardware at each location, compatible wireless equipment, or a combination of the two. HP also plans to sell the Lap Dock that is like the old Motorola Lapdock: Slide your Elite X3 into it and you have a functioning Windows Mobile laptop computer. Note that its ports differ from the Desk Dock: There are two USB-C ports and one MicroHDMI port (not common on displays, so you'll need an adapter), plus built-in 802.11ac Wi-Fi. HP says a bundle of the Elite x3, the Desk Dock, and Lap Dock will cost $1,299. There's no word as to whether the Lap Dock will be available for separate purchase as well. Bluetooth roulette: Windows 10 Mobile isn't very helpful in distinguishing among Bluetooth devices when you try to pair a keyboard or mouse. All devices in range show up, most marked as simply "Accessory." The Elite x3 also supports Bluetooth keyboards and mice. 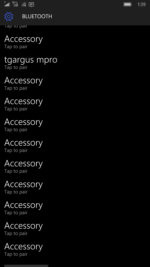 But be warned that Windows 10 Mobile is pretty stupid about Bluetooth devices, so you'll get a list filled mainly with ones named "Accessory." They could be computers, smartphones, headsets, keyboards, mice, earbuds, or headphones. Some will be more clearly named; my Apple Magic Mouse showed up as Mouse, for example. Even then, in an office with lots of Bluetooth devices, you won't know which "Mouse" is yours. Users at a minimum will definitely need to carry adapter cables for displays. Because Bluetooth keyboards and mice are not standard-issue outside Mac environments, users may want to carry those devices or a spare Desk Dock when they travel. They could buy a Lap Dock, but then why not issue them a laptop in the first place? It will cost less and provide more capability. As a smartphone, the Elite x3 is a beast. It's too large -- 16 percent larger than a Galaxy Note 5 and 9 percent larger than a iPhone 7 Plus, the leading phablets -- to be used single-handedly, so you'll need both hands free to work with it. It's also heavy: 6.8 ounces, or 14 percent heavier than the Note 5 and 8 percent heavier than the iPhone 7 Plus. The HP Elite x3 should be the size of the iPhone 7 or Galaxy S7 to be used widely as a smartphone; phablets are popular but still not the main preference of users. Further, the Elite x3 doesn't support any advanced security-access mechanisms like a fingerprint reader, as business-class devices like the Apple iPhone and Samsung Galaxy S series do.